Visit Theodora Goss' website for more information. 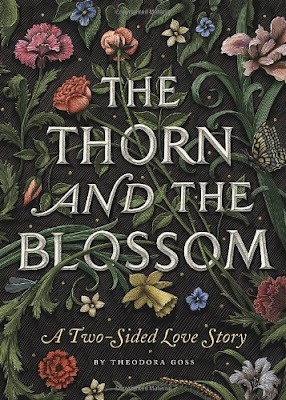 If I was giving out an award for most creative book format The Thorn and the Blossom would win it hands down. Instead of a normal book you have an accordion style binding that allows you to read two different views of the same story depending on which side you start from. The book is held together in a cardboard sleeve to stop it unfolding when on the shelf. One side of the book introduces Evelyn, a young woman with an interest in medieval literature who is in Cornwall on holiday after finishing a term studying at Oxford university. She only has a week to relax before she returns home to America to complete her education. The other side introduces Brendan, a local teenager who is currently working at his father's bookstore while trying to decide what he wants to do with his life. Their paths cross in the bookstore and then the book follows them over several years as life takes them both in different directions but always seems to draw them back together again eventually. I absolutely love the idea of this book, the creative format is something I've not come across before and there are 4 beautiful illustrations by Scott McKowan. Although the setting is contemporary the two main characters share a love of Medieval literature - especially the tale of Elowen, the queen of Cornwall, and Gawan, one of the knights of the Round Table, who agrees to help her fight the giants plaguing her lands - so at times it has quite an old fashioned feel to it. I enjoyed getting to see both sides of the romance but because it was written so you could read their stories in either order it meant that you ended up reading the exact same conversations and events twice which made it a little repetitive. Yes the character's internal thoughts were slightly different each time and they are both keeping secrets from each other but essentially you don't learn a great deal more by reading the second story no matter which one you start with. I think I'd have enjoyed it more if there was a set order to read the points of view in so that the second story could cover events that you hadn't seen in the first half, for example you wouldn't need to see their meeting twice if you read that in Evelyn's part and Brendan talked more about the first week they spent together while Evelyn's story skipped ahead to their second meeting etc. It would have allowed the author to flesh out the story a bit more and I think that would have made it easier for me to connect to the characters and become more invested in their romance. As it was things happen a little too quickly, there are a few too many large jumps in time (they meet, spend a week together and the next thing you know it's 8 years later! ), and Brendan in particular was keeping a major secret that I really would have liked a little more information on. I also would have loved more of a solid ending to the story, it's left with a feeling of hope to it but personally I prefer something more definite and less open ended. There is no doubt that this is a beautiful and unique book though and I'm glad I have a copy on my shelves.